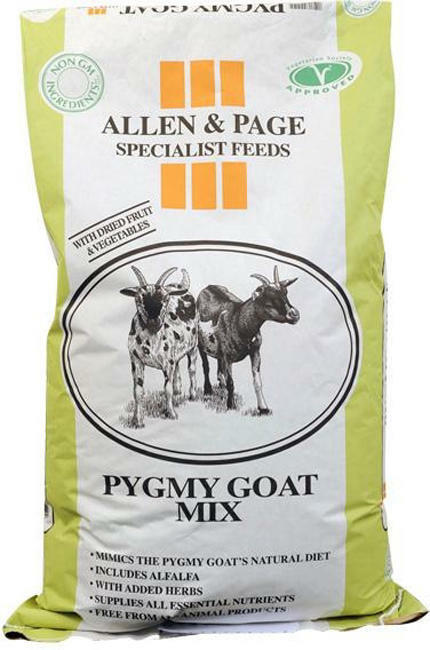 Allen Page Pygmy Goat Mix is a wholesome feed with higher fibre levels, dried fruit and vegetables which mimics the Pygmy goat's natural diet as closely as possible. Pygmy goats thrive on routine so try to feed them at the same time each day. It is advisable to feed them twice per day – so split the mix evenly between each meal. The rest of their daily diet should be made up of good quality hay, which can be made available at all times for them to help themselves. Make sure that clean, fresh water is also available at all times. Feed between 80 to 270g per day depending on size, and condition.